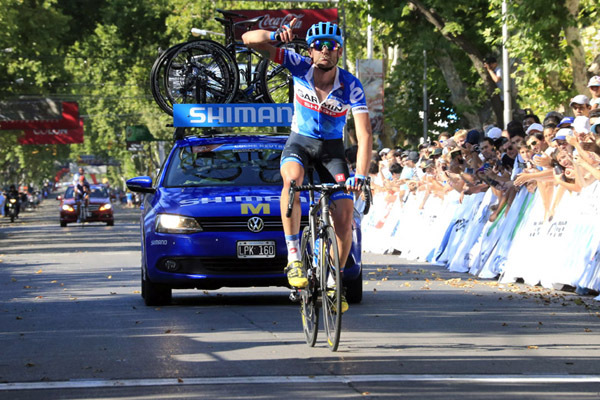 American Phillip Gaimon (Garmin-Sharp) appears ready to sweep the Tour de San Luis. He took the red leader’s jersey after an escape in day one and passed the critical test yesterday, defending his four-minute lead in a summit finish. If he remains consistent, he will keep the jersey to the race’s end on Sunday. Gaimon just turned professional after several years in third division, US teams. In Argentina, he was due to work for Tom Danielson. He said that the leadership and new status has been a shock for him. The rider from Georgia relaxed and soaked in the moment at 1247 metres, the top of yesterday’s finish to Mirador de El Potrero. A green “CLEAN” tattoo covers the underside of his right arm and pokes out of his jersey. Big stars, winners in the Tour de France, finished and returned down the climb. The only other time that Gaimon raced with such stars – including Cavendish, Peter Sagan and Joaquím Rodríguez – he was in California. His Bissell Cycling team road the Tour of California last year even if Gaimon had to abandon in the third stage. Jonathan Vaughters signed the 27-year-old for his Garmin team after Danielson suggested him. The two had been training together regularly and Danielson, eighth in the Tour de France, knew what Gaimon was capable of. Gaimon took his golden opportunity on Monday. He escaped with a small group that, instead of losing time, maintained its advantage towards the line. Cavendish’s sprint team lost Alessandro Petacchi to stomach problems early in the stage. Its men continued to pull but eventually gave up when other teams failed to cooperate. By that point, Gaimon or Marc De Maar (UnitedHealthcare) appeared ready to win the race’s overall already on day one of seven. Both can climb and time trial well. De Maar, however, lost his chance 25 kilometres from the line when a motorbike caused his crash. Gaimon kept going, won the stage and the red leader’s jersey. He leads by 1-47 over De Maar and 4-16 over the favourites. After his ride yesterday, losing only 19 seconds on the Mirador de El Potrero, he appears ready to continue his reign. Gaimon said that it was “a big relief” to pass the mountain test well. Seven more stages remain, including two summit finishes and a time trial. Today should end in a sprint, perhaps suited to Cavendish. With four-plus minutes, Gaimon should be able to hold off rivals including Vincenzo Nibali (Astana) and Joaquím Rodríguez (Katusha). Garmin will help Gaimon do so.